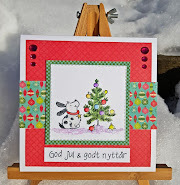 Hos Dorte: M for Mail, DT card for ABC Christmas Challenge. 25 Christmas cards in your pile by now. the image is called 'Lots of Letters'. The round Christmas sentiment is also from LOTV. ribbon and charm from my stash. The backside of the card. The sponsor for the M for Mail challenge is Shape EZ. 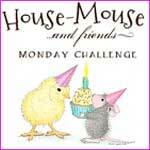 to check out the fabulous DT inspiration and join in with our M challenge. and only shows one post at the time. Today it's okay again ;). trying to organize and coordinate a lot of things. Hopefully things will calm down next week, until then; take care. this is a beautiful card with a sweet image Dorte. Very cute card! Thanks for playing at Christmas Card Challenges. Gorgeous card Dorte :-) the topper is fabulous and the papers and layout are lovely too. Thanks for entering our Christmas Card Challenges this week! Super cute card with a darling image. Thanks for joining us at Christmas Card Challenges this week. Gorgeous card Dot, the image is adorable.